A sign on the porch of a house in the Bywater neighborhood protests the proliferation of Airbnbs in New Orleans. All photos by the author. Along Governor Nicholls street in New Orleans there are cars from all across the country parked in front of renovated shotguns and Creole cottages. The plates bear the origins of the travelers: some hail from nearby Mississippi, Alabama, or Arkansas, while others have descended upon the Big Easy from farther-flung corners of the U.S.: Vermont, New York, Michigan. New Orleans has long drawn visitors from across the country and the world. Now many of those tourists are spending their nights in Airbnbs. In the half-mile stretch between Rampart Street and Claiborne Avenue, over a dozen of the houses on Governor Nicholls are rented out via the website, rendering the road more like a string of hotels than a cohesive community. This block is part of the Tremé: one of the oldest Black neighborhoods in the United States. One corner is home to St. Augustin Church, still marked by a spray-painted X indicating that it had been searched for bodies in the days following Hurricane Katrina. Outside the building is a large cross made of chains: The Tomb to the Unknown Slave. With a short-term rental, a Tremé property owner can make more than the area’s average monthly rent in just four days. With a short-term rental, a Tremé property owner can make more than the area’s average monthly rent in just four days. These loosely regulated short-term rentals prioritize the desires of tourists over the needs of residents. Local housing advocates are seeking to change that. The first advocacy group to frame the proliferation of short-term rentals as a housing crisis in New Orleans was the Jane Place Neighborhood Sustainability Initiative. According to its website, Jane Place is “a Community Land Trust (CLT) and housing rights organization committed to creating sustainable, democratic, and economically just neighborhoods and communities in New Orleans.” As a community land trust, Jane Place purchases and holds property permanently, and rents out homes on its properties at an affordable rate. Community land trusts have a Southern lineage. In 1969, Civil Rights activists established the first land trust in the United States: a 5,000-acre farm near Albany, Georgia called New Communities. The community land trust model holds a critique of capitalism and private development at its core. It’s this focus that positioned Jane Place to take up the mantle in the fight to curb short-term rentals. Frank Southall (center), Lead Organizer of the Jane Place Neighborhood Sustainability Initiative, at a Renters Rights Assembly in March. When DeDecker began seeing low-income tenants on her block in the 6th ward getting evicted so that speculators could turn their homes into short-term rentals, she became increasingly vocal. In 2014, members of local neighborhood associations began appearing before the City Council to complain about rowdy Airbnb tourists disturbing residents. DeDecker connected with Jane Place, which had been around since 2008, and they became dedicated to shifting the narrative around short-term rentals from a conversation tinged by NIMBYism to one more broadly concerned with displacement and gentrification. Up until 2017, operating a short-term rental in New Orleans was an illegal practice, but the city rarely enforced the ordinance. When the City Council legalized short-term rentals that year—after alleged negotiations between then-mayor Mitch Landrieu and Airbnb lobbyists—the number of short-term rentals in New Orleans skyrocketed. Between 2015 and 2018, the Tremé experienced an 84 percent increase in short-term rental listings; St. Claude saw a 100 percent increase, and Central City a 178 percent increase. Though the move toward a broad approval of short-term rentals upset Jane Place’s efforts to curtail their escalating effects, the change also made the short-term rental market more transparent. It became easy for short-term rental operators to register their properties with the city. And the new law included a caveat that Airbnb would need to start sharing data about its practices. All of this meant that that Jane Place now had access to long-shrouded information about how short-term rentals supercharged gentrification in New Orleans. Using that data, Jane Place released a report in March called “Short-Term Rentals, Long-Term Impacts: The Corrosion of Housing Access and Affordability in New Orleans.” Their research found that 82 percent of Airbnb listings in New Orleans were for whole-homes, which take units off the market and diminish the housing options available to New Orleanians. The data also showed that many large-scale short-term rental operators are based outside of the city and, at the time of publication, only 18 percent of those operators controlled nearly half of all legally registered short-term rentals in the city. Signs created by New Orleans printmaker Tyler Harwood for the Jane Place Renters RIghts Assembly. The addresses of short-term rentals revealed their oversaturation in predominantly Black and low-income neighborhoods bordering downtown and the French Quarter. This proliferation, Jane Place argues, has contributed to an overall rise in housing prices. 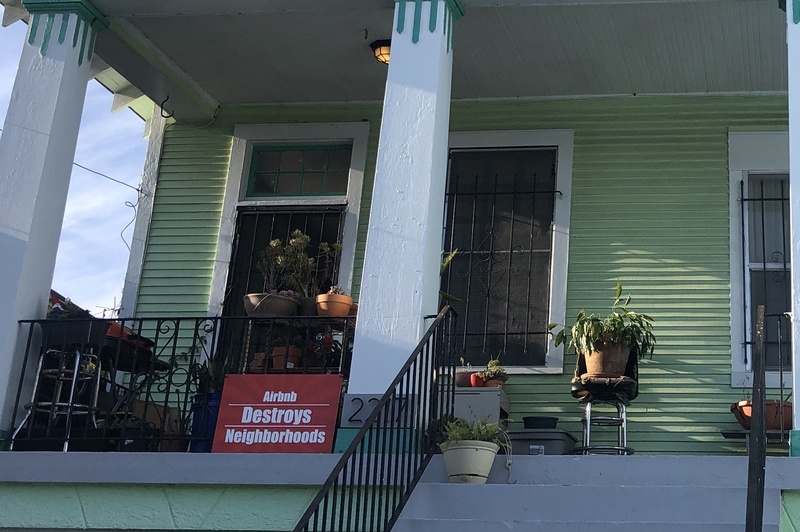 In the Bywater, one of nine neighborhoods with the highest concentration of short-term rentals, the median rental listing price of a three-bedroom home increased by 72 percent between 2009 and 2015. And even as rents continue to rise across the city, a landlord can still make more money renting a property to a visitor than to a full-time resident, particularly in gentrifying neighborhoods. In 2017, the city began collecting a $1-per-night fee from Airbnb to put into a fund for developing affordable housing. The Jane Place report points out that in the first nine months, the fund accrued just $230,000 from Airbnb—enough money to create only one unit of affordable housing. Jane Place’s report exposed a central lie in the marketing of short-term rentals. Airbnb advertises itself as a “people-to-people platform [that] benefits all its stakeholders, including hosts, guests, employees and the communities in which it operates.” But Airbnb does not innocuously allow homeowners to make some extra cash off of a spare bedroom. It offers an opportunity for speculators to profit off of a city. Airbnb does not innocuously allow homeowners to make some extra cash off of a spare bedroom. It offers an opportunity for speculators to profit off of a city. In December of 2018, Councilwoman Kristin Palmer proposed a new suite of short-term rental regulations that take into account many of Jane Place’s concerns. Palmer’s plan, which is expected to reach a final vote this month, includes a prohibition against all whole-home rentals without a homestead exemption in residential areas. This would effectively mean that only people who own more than one housing units on the same property (such as a duplex) and live in one of the units could rent their other units through Airbnb. The Councilwoman has also called for short-term rental operators in large, commercially-zoned buildings to match each short-term rental with one unit designated as long-term affordable housing. Additionally, Palmer has suggested increasing booking fees on short-term rental platforms to gain more money for the affordable housing fund. As the Council prepares to vote, it has called on the City Planning Commission to conduct a study about the effect of short-term rentals on the city. Both the Council and the Planning Commission have held several public comment sessions. Tensions tend to run high. Members of the Alliance for Neighborhood Prosperity—an organization of “property owners, property managers, and others who support and promote responsible private home rentals,” according to the group’s website—show up in numbers. At one CPC meeting in February, Melanie Martin, an ANP supporter gave a tearful testimony to the commissioners. Jane Place continues to push for short-term rental policies that put the residents of this city—the chefs, musicians, artists, hospitality workers, and all who make New Orleans what it is—above the tourists who come to revel here.